Summary: In 1839, José Policarpo Rodriguez came north with his father from Zaragosa, Mexico, to the Republic of Texas. Poli was ten years old when he arrived in Texas, and he and his father settled in the Hill Country near San Antonio. Poli grew up with Comanches, surveyed territory for the Republic of Texas and the United States Army, fought against warring Indians, and mapped settlements for nineteenth-century German settlers in Texas. He was the first non-Indian to discover the Big Bend Country and Cascades Caverns, and during the Mexican-American War and the Civil War, he was Captain of the San Antonio Home Guard. Caught between the three main elements that made up early Texas—Mexicans, Indians, and Anglos—he struggled to decide where his true loyalties lay, and his decisions showed a kind of courage that was rare in those days. . .and is still rare today. 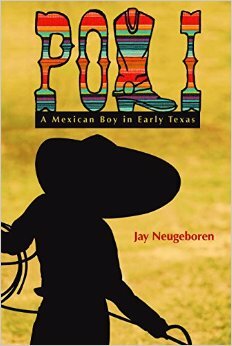 Review: In celebration of it’s 25 anniversary, Texas Tech University Press has decided to re-release Poli: A Mexican Boy in Early Texas, and I happen to agree that this was a good move for the publisher. This historical novel is a quick and entertaining read that touches on a brief period of history that shows the tensions between the Comanche Nation, Mexicans, and the early Texans. The story follows young Jose Policarpo Rodriguez, and is based on the real Poli’s memoirs. The novel begins when Poli is 10 years old and just arriving in Texas from Zaragosa. Poli and his father have left Mexico for a better life after the death of his mother and other family members. Poli’s father then sends him to spend a week with the Comanche nation and there Poli forms a friendship with the Chief’s son, Eagle Blood. It is through his relationship with Eagle Blood that Poli is able to see and understand all three sides of the land use issue that is the cause of the tension between the Native Americans, Mexicans, and the Texans. Because of his relationship, Poli is also able to work as a surveyor and as a translator during negotiations that ultimately fail. The fact that Poli is so trusted by adults shows how during this period of time, adolescents were treated as adults and give adult responsibilities. Poli had to mature fast because of the harshness of life on the plain. Not knowing much about Texas history, except what is briefly given in school textbooks, I found the focus on the lives of those effected in San Antonio fascinating as it took a larger conflict and allowed the reader to see how it effect the daily lives of the people who lived during that time period. I found it very easy to relate to Poli as through his travels he missed his father, and his friendship with Eagle Blood felt true and real. I feel that Neugeboren did his research in getting the historical details correct, especially when sharing the lifestyles and beliefs of the Comanche people. Neugeboren was able to handle the tension between the Comanche, the Mexicans, and the Texans in such a manner that the reader fully understood and empathized with the different factions (okay, maybe not so much with the early Texans as a whole, but the individuals whose lives were thrown in to chaos because of the fighting, yes). While the novel is written for middle grade, Neugeboren writes in such a way that Poli would be enjoyable for readers of all ages. I feel this would be an excellent supplemental novel in a social studies class, as well as a good read of the youngster who enjoys historical fiction. To celebrate the release of the 25th Anniversary Edition of Poli: A Mexican Boy in Early Texas, we have two copies to give away! Raffle ends March 17th. Enter Now!